Parents to newborns resort to crib bumpers in order to create a cozy environment to help babies sleep through the night. They’re used to cushion babies from the hard crib rails should they bump against it from rolling in their sleep. The bumpers are also used to prevent the baby’s arms and legs from sliding between the rails and to block drafty air which can wake the baby up in the night. The American Academy of Pediatrics, however, warn against these cute and fluffy crib bumpers that were found to be directly connected to 48 infant deaths and 146 injuries from 1985 to 2012 through suffocation, strangulation, and entrapment. Even more alarming, the annual rate of such deaths tripled from 2008 to 2012. Safe alternatives to crib bumpers have been introduced to the market to address such concerns so there’s no more reason for sleep-deprived parents to lose any more sleep over these figures. Mesh crib liners are the most common crib bumper alternative that people make use of. These are safer for your baby than the normal solid crib liners. The mesh design allows air to flow through and this significantly reduces the risk of suffocation. The reason that you are looking for a crib bumper alternative is likely that you are worried about the safety of your baby. You need a way to protect your baby from getting stuck in the rails that won’t put them at risk. If you purchase one of these mesh crib liners, it is going to be a lot safer. You won’t have to feel quite as concerned about your baby getting harmed by this. It is a lot better than using a standard crib bumper, so you will want to choose this over that option. It isn’t completely impossible for something to go awry when using this mesh crib liner, but it is far more unlikely. Your baby will be protected from getting stuck in the railing and the mesh material is breathable to allow oxygen to get through. This is as safe as you are going to be able to make something like a crib liner. It is up to you to decide whether or not you need to use one of these. The mesh material isn’t very thick, so it isn’t going to act as a cushion if your baby has a habit of bumping up against the rails. This can be a problem if your baby hits their head on the rails. Mesh crib liners are simply designed to keep the baby from becoming stuck in the rails. They aren’t meant to prevent them from hurting themselves on the rail if they bump into it. You can install the mesh crib liner to keep your baby from getting stuck in the rails. The breathable mesh material reduces the risk of suffocation. These mesh crib liners come in many sizes and most are adjustable to fit any type of crib. This is a convenient product to use and should keep your baby safe. Some experts still don’t think that these mesh crib liners are completely safe for your baby. They think that it would be better to simply leave the baby in the crib without such things. If your child has a problem with getting stuck in the rails, then this can remedy that problem. It can’t prevent the child from bumping their head on the rails though, as the mesh liner isn’t going to be able to soften that type of blow. Vertical crib bumper pads take a different approach to the problem of crib rails. Instead of lining the crib to protect the child, these crib bumper pads are attached right to the rails themselves. There is a bumper pad that will attach to each individual rail on the crib. They work to prevent your child from getting injured on the rails and will also make it far less likely for them to get stuck in the rails. It isn’t completely impossible for a baby to get stuck in the rails with these vertical crib bumper pads, but it is highly unlikely. The bumper pads are spaced out enough that there is some space between each rail. It’s just not a lot of space, and it isn’t likely that your baby will have any issues with this. They are designed this way to reduce the risk of suffocation. One of the reasons that people are concerned about using traditional crib bumpers is that some experts fear the risk of a baby suffocating on the bumper pad itself. The likelihood of this happening is very slim when you use the vertical crib bumper pads. The way that they are situated allows for air to flow through, so it would take a very unusual circumstance for an accident to occur with these. If you want to keep your baby from getting hurt on the rails of the crib, then these will work great to protect them. Installing vertical crib bumper pads is very easy to do. You will be able to put them on each individual rail and this will keep your baby from getting hurt or getting stuck in them. You will be able to find a nice color that will go well with everything else that you have going on in the room. Once you have it all set up, you’ll be able to feel a lot safer putting your child to bed. It isn’t completely impossible for a baby to get stuck in the rails of their crib when using these bumper pads. The space between the rails does leave the possibility for them to get stuck. It is very slim though, and it isn’t something that you should worry about. This space is there to protect your baby from suffocation and the risk of the baby getting an arm or leg between the rails is quite low. Crib rail covers will work nicely when you want to keep your baby safe from getting stuck in the railing of the crib. These are covers that will attach to the railing itself from the top. They hang down and will prevent your baby from being able to get their little arms or legs between the rails. This is a very simple solution that works nicely to keep them protected. Another good reason to purchase these crib rail covers is that they will prevent your child from trying to teethe on the rails. For whatever reason, many babies wind up trying to bite the rails of their cribs. It is some sort of natural inclination to bite things that are genetically wired into many babies. This obviously isn’t good for them and can wind up harming their teeth and gums. Simply installing these crib rail covers is going to keep your baby from harm. They won’t be able to get stuck in the rails of the crib and they won’t hurt themselves while playing in the crib. Active babies need to be looked after a bit more carefully. 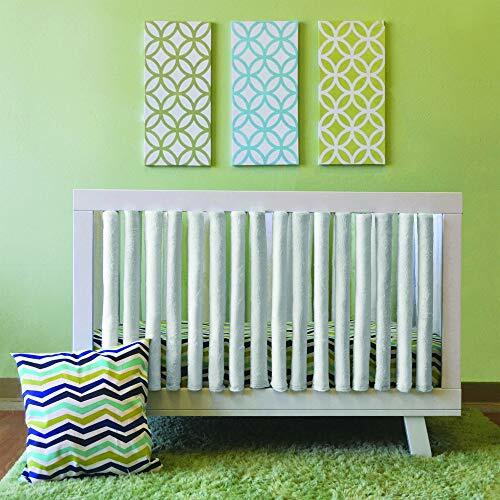 These handy crib rail covers will allow you to sleep a little easier knowing that your baby won’t be able to come to harm. Installing these crib rail covers is very simple. They will work to protect your baby from getting stuck in the crib railing. They come in many different colors and will look quite nice overall. You also won’t have to worry about your baby bumping their head on the rails or trying to bite the railing. Some people see crib rail covers as an unnecessary purchase to make. There are many health professionals who think that a baby will be just fine with the crib as it is. They are very cost effective though, so it really isn’t any harm to install crib rail covers. If you are worried about your child’s safety, then you should feel fine about making the decision to purchase these. Baby sleeping bags are another crib bumper alternative that has been gaining steam lately. It is important to be able to keep your baby as safe as possible while they are sleeping. The approach to keeping them safe is a little bit different when you make use of this method. When your baby is put to bed inside of this convenient little sleeping bag, they won’t be able to get stuck in the rails of the crib at all. Some babies are going to take better to sleeping inside of these sleeping bags than others. For the most part, babies tend to like these sleeping bags once they get used to them. Some of these models are even designed with swaddling in mind, so that can be an added benefit if you like to do that. These sleeping bags are conveniently designed so that your baby can feel comfortable while inside of it, so it’s going to be a good solution. 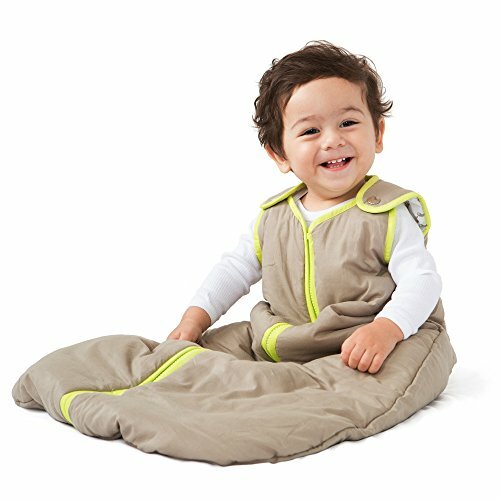 Your baby can stay warm and feel relaxed inside one of these convenient sleeping bags. They won’t be able to reach the rails of their crib while they have the sleeping bag on, so you won’t have to feel concerned about their legs getting caught in the rails. Also, they won’t be able to move the blankets around, so this can protect the baby from smothering. It’s a good solution that can make you feel a lot safer. This is a cost-effective crib bumper alternative that is easy to make use of. You can put your baby in the sleeping bag and they will feel very comfortable. Your baby should be able to sleep soundly in the sleeping bag and will be safe from potential risks. If you want a good crib bumper alternative that will also keep your baby nice and warm, then this is going to be the option to turn to. This doesn’t actually do anything to alter the rails of the crib. Your baby would need to stay inside of the sleeping bag at all times while in the crib for them to be protected. Some babies may not like being inside of the sleeping bag either. It depends on the baby and if they don’t take well to it, you may want to find another option.